Opening the wider door of cooperation among India, Afghanistan and Iran, the much awaited project of Chabahar port became operational on Sunday when foreign ministers of the three countries flagged off the first shipment of wheat from India to Afghanistan. Six more wheat shipments will be sent to Afghanistan during next few months. External Affairs Minister Sushma Swaraj, Iranian foreign minister Javad Zarif and Foreign Minister of Afghanistan Salahuddin Rabbani, had jointly flagged off the shipment from India to Afghanistan through a video conference. According to a statement issued by Ministry of External Affairs, the shipment is a part of India’s commitment of supplying 1.1 million tons of wheat for the people of Afghanistan on grant basis. “The three foreign ministers welcomed the fact that this is the first shipment that would be going to Afghanistan through the Chabahar port after a trilateral agreement on Establishment of International Transport and Transit Corridor was signed during the visit of the Indian Prime Minister to Iran in May 2016,” the statement said. It will pave the way for operationalisation of the Chabahar port which is being developed by India as an alternate, reliable and robust connectivity to Afghanistan. The first shipping of Indian wheat supplies through Iranian port was flagged off at a time when US is hardening its position over Iran and has decertified the 2015 nuclear deal between Tehran and six world powers, including five permanent UN Security Council members and Germany. Despite Trump’s anti Iranian moves, Russia and European countries have decided to continue with the deal. India has announced an investment of $ 500 million in Chabahar port complex and the strategic port is expected to be fully operational by the end of 2018. Earlier this year, Tehran offered New Delhi a proposal to manage phase one of the port built by Iran for a period of two years which could be renewed by another decade. Pakistan does not allow Indian goods to pass through its territories for Afghanistan. India and Afghanistan have also launched an air cargo corridor between New Delhi and Kabul June this year. US President Donald Trump, while announcing new Afghanistan strategy in October, had asked India to do more to help development in Afghanistan. In September this year, External Affairs Minister Sushma Swaraj had assured her Afghan counterpart Salahuddin Rabbani to speed up the development work at Chabahar port. Rabbani had raised the issue while meeting Swaraj in New Delhi. He had also asked India to expand the air freight corridor. Chabahar is to be linked with Delaram-Zaranj road built by India in Afghanistan that connects Afghan-Iran border via Zahedan. A road connecting Iran-Afghan border point to Chabahar already exists. India is also constructing Chabahar-Zahedan railway line to connect the port to the rest of Iranian railway network. Once completed, this will help to connect North-South Transport Corridor connecting India to Russia and rest of Europe. 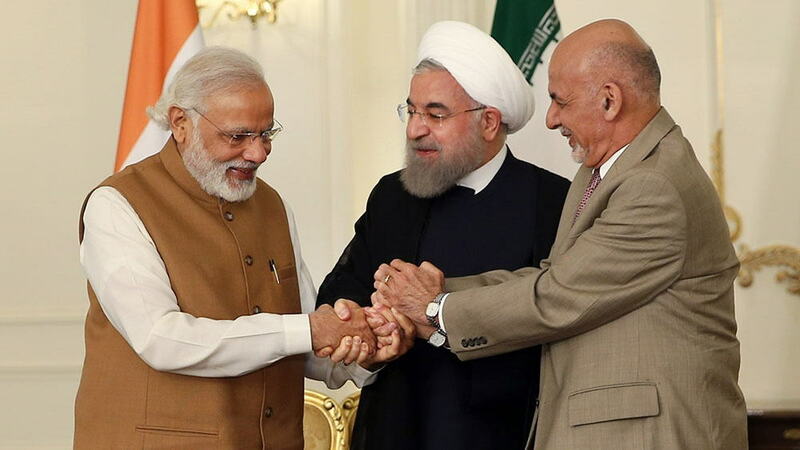 The historical trilateral deal to develop Chabahar port was signed by Prime Minister Narendra Modi, Iranian President Hassan Rouhani and Afghan President Ashraf Ghani in Tehran on May 24 last year. The project, once completed, will halve the time and cost of doing business with Central Asia and Europe. Development of Iran’s Chabahar port by India is seen as a balancing act. China has earlier developed Gawadar port in Pakistan for creating link to Indian Ocean region. India started negotiations with Tehran more than a decade ago.